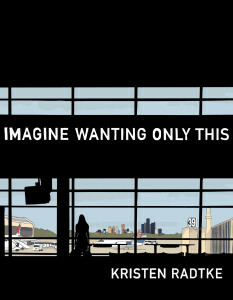 Kristen Radtke’s aimless comics memoir Imagine Wanting Only This is about little more than a writer in search of a story. Kristen clumsily wanders through a series of inspired diversions with hope that, despite minimal effort, one might resonate and grow into the life-defining focus that she feels her writing requires. She self-consciously dabbles in travelogue, film criticism, medical diary and investigative journalism but does so with little commitment, leaving far too many interesting ideas under-developed. While a forgiving reader could eventually reframe these tangents into a story about false starts and how a person shouldn’t need to know what they want to be in order to live their life with fullness, a writer should know what kind of story they want to write in order to make a successful book. Radtke ends up with a ambivalent memoir that, despite some standout individual scenes, is difficult to view as a polished work. The only cohesion in the memoir is Radtke’s clean and precise artwork. Shaded with a minimal gradient of gray, Radtke’s drawings feel as lively as computerized photography, as alluring and disarming as rotoscoped film. This tonality is aesthetically captivating but difficult for a book that asks for so much empathy: Radtke’s art is minimal, confident and reads like she’s found a new way to draw, but is standoffish at times, often robotic and absent of feeling. Kristen is haunted by a genetic heart problem that runs in her family called dilated cardiomyopathy, which in one scene is chillingly described by a doctor as when a person’s heart “beats itself to mush.” Her beloved uncle succumbed to the rare disease while she was in college and his absence, along with her own potential for a cardiological emergency, permeate the memoir with equal parts fear for the future and recollection of the past. When the memoir opens, Kristen is an art-school hipster at a college “where puppeteering was a major and dropout rates were high.” Radtke has a keen ear for the cringe of young intellectualism, such as the sweetly embarrassing line “really you can’t say the word ‘yes’ without invoking James Joyce” that Kristen’s boyfriend Andrew tries out when they first start dating. Kristen and Andrew visit Gary, Indiana after hearing of its post-apocalyptic state of decay with hope that it might inspire some creative work. They find a pile of moldy old photographs and Kristen decides to take them home thinking she might use them in a photography project of her own. Kristen’s visit appears to initiate a vague lifelong interest in ruined places: “Since Gary I’d been consumed by the question of how something that is can become, very suddenly, something that isn’t.” Although this sentiment appears to be the formation of an overarching theme of loss, decomposition and reappropriation, it instead acts as an invitation for the memoir to flow arbitrarily, to shift from being a book with one particular focus to something entirely different. Kristen and Andrew’s relationship is perfunctorily developed and perfunctorily ended: after a bit of narration explaining “We began resenting each other for the time we spent or wanted to spend together,” Kristen decides she needs space. She moves temporarily to Como, Italy, all while trying to convince herself that the ruins of Gary had something to do with the decision. 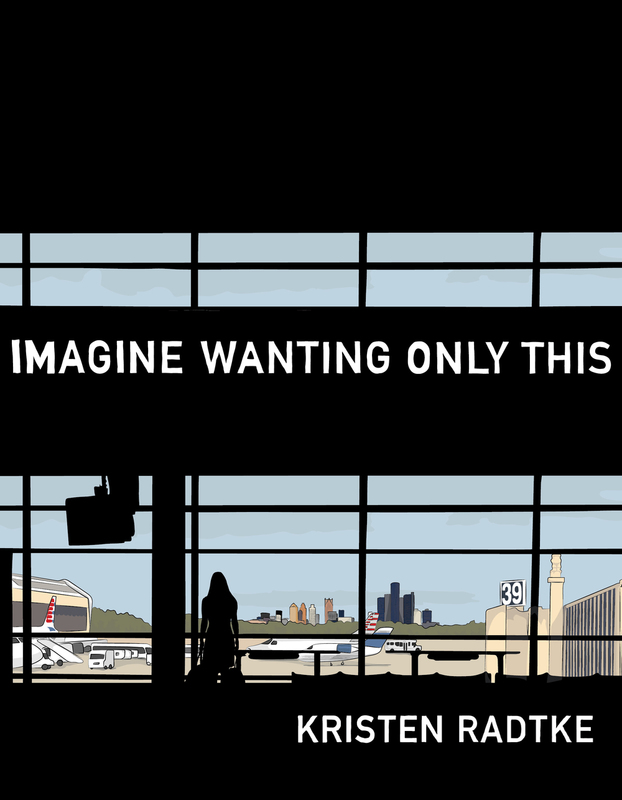 The wandering elements of Imagine Wanting Only This are particularly problematic because they are intensively developed but practically ignored in subsequent episodes. She discovers the creator of the photos she found in Gary, devotes a span of pages to his story, and then moves on to other obsessions. Some tangents appear without any sort of introductory flow: for instance, late in the memoir Kristen teaches a class on cinema, but there’s hardly any mention of film in the book until she’s suddenly in front of her students. In one scene, her mother develops a “sudden interest in genealogy” (Kristen suspects but “never asked” if her uncle’s death triggered this new hobby). This prompts a forty-page historical aside about the Peshtigo Fire of 1871 in Wisconsin and a distant relative named Adele who saved a lot of lives and may become a saint. This segment expands into and exemplary stretch of storytelling that realizes the best of Radtke’s artistry. Her frames push towards full-bleed drawings, she experiments with overlays, formal motifs and the difficult transference of research into the comics form. It’s a great success, but this digression lands in a way that will make readers wonder how good Radtke might be if she commit entirely to history without the needless frame of her college years. During this Peshtigo segment, Radtke confoundingly says “in truth, I didn’t care that much about Adele, what she had done or not done.” If she’s not interested in her own stories, why should her readers care? She explains: “I loved the mythology of it all. She gave me a connection to the fire that made me feel like I had some right to the story.” A little earlier, on an airplane, a man asks “so whattya do?” “Nothing really,” she says. “Traveling, and going back to school.” This kind of shrugginess is difficult to shake throughout the entire memoir: readers can easily match the malaise of each of Radtke’s short journeys, lost somewhere between soul-searching and indifference.